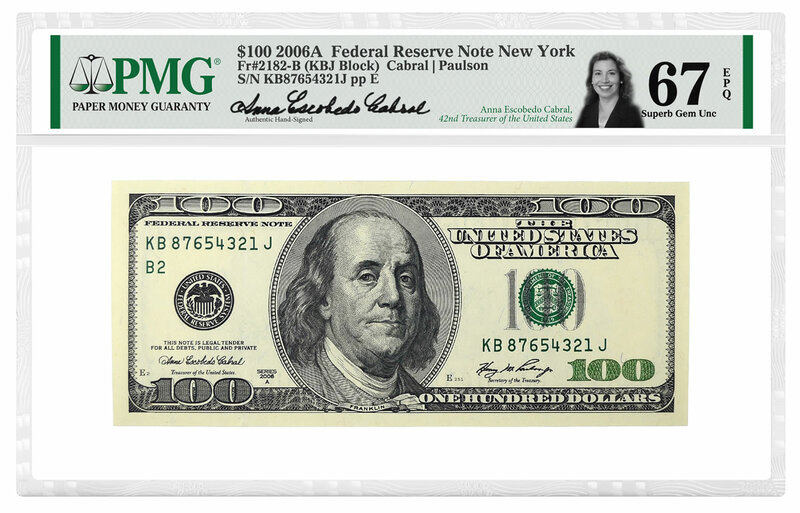 Paper Money Guaranty® (PMG) is excited to announce that Anna Escobedo Cabral, the 42nd Treasurer of the United States, will individually hand-sign certification labels exclusively for PMG. This is the first time that PMG has offered signed certification labels. An affiliated company, Numismatic Guaranty Corporation® (NGC), has offered a variety of popular authentic hand-sign labels, including ones autographed by US Mint Chief Engravers Elizabeth Jones and John Mercanti, 38th US Mint Director Edmund Moy and the "Coinage Congressman" Gov. Hon. Mike Castle. "I’m excited to have this opportunity to again be involved in the numismatic community," says Cabral. "The popularity of paper money collecting continues to grow both in the US and abroad." "We are delighted to work with Anna, who is incredibly accomplished in numismatics, politics, law and elsewhere," says Steven R. Eichenbaum, CEO of PMG. "Her autograph enhances the collectability of the notes issued under her watch as Treasurer of the United States."